Showing 1 - 9 of 9 articles tagged "David Spade"
The Juno collaborators are reteaming for an untitled comedy series starring Spade as a semi-famous former 1990s heroin-addicted grunge musician. "Fuzzy picture but i love it," the comedian captioned a fuzzy photo he posted to Instagram. 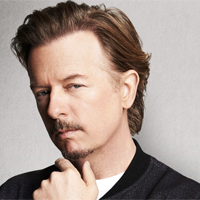 Watch Kate Spade on her brother-in-law David Spade's NBC sitcom Just Shoot Me! The iconic fashion designer, who died today of an apparent suicide at age 55, made very few TV appearances. The stars of the NBC sitcom are still close 14 years later.